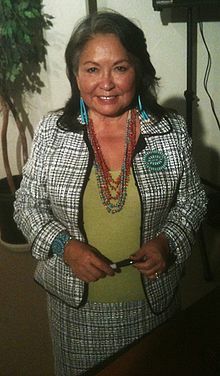 Luci Tapahonso (born November 8, 1953) is a Navajo poet and a lecturer in Native American Studies. She is the first poet laureate of the Navajo Nation, succeeded by Laura Tohe. Born on the Navajo reservation in Shiprock, New Mexico to Eugene Tapahonso Sr. and Lucille Deschenne Tapahonso. English was not spoken on the family farm, and Tapahonso learned it as a second tongue after her native Navajo. Following schooling at Navajo Methodist School in Farmington, New Mexico, she attended Shiprock High School and graduated in 1971. She embarked on a career as a journalist and investigative reporter before beginning her studies at the University of New Mexico in 1976. There she first met the novelist and poet Leslie Marmon Silko, who was a faculty member and who proved to be an important influence on Tapahonso's early writing. She initially intended to study journalism at New Mexico, but Silko convinced her to change her major to creative writing. She earned her bachelor's degree in 1980. In 1983, Tapahonso gained her MA in Creative Writing, and she proceeded to teach, first at New Mexico and later at the University of Kansas and now at the University of Arizona. Silko helped Tapahonso publish her first story, "The Snake Man", in 1978. Her first collection of poetry, One More Shiprock Night (assembled when she was still an undergraduate), was published in 1981, but did not make much impact. Following Silko's lead, Tapahonso's early work is often mystical and places much importance on the idea of the feminine as a source of power and balance in the world. She also frequently uses her family and childhood friends in her poetry. Several more collections followed, as well as many individual poems which have been anthologized in others' collections, activist literature, and writing in magazines. Her 1993 collection Saánii Dahataal (the women are singing), written in Navajo and English, was the first to gain her an international reputation, a reputation then cemented by 1997's blue horses rush in. In 2008 Tapahonso published A Radiant Curve, for which she will win the Arizona Book Award for Poetry in 2009. Tapahonso's writing, unlike that of most Native American writers, is a translation from original work she has created in her tribe's native tongue. Her Navajo work includes original songs and chants designed for performance. For this reason, her English work is strongly rhythmic and uses syntactical structures unusual in English language poetry. ^ Tillett, Rebecca (1 August 2001). "Luci Tapahonso". The Literary Encyclopedia. Retrieved 14 May 2014. ^ "Tapahonso, Luci 1953-". lccn.loc.gov. Library of Congress. Retrieved 14 May 2014. ^ a b "Luci Tapahonso Named as Navajo Nation's First Poet Laureate". Indian Country Today Media Network. 30 April 2013. Retrieved 14 May 2014. ^ White, Kaila (25 September 2015). "ASU professor Laura Tohe named Navajo Nation's second poet laureate". The Arizona Republic. Retrieved 6 August 2016. ^ a b c d Sonneborn, Liz (2007). A to Z of American Indian Women. A to Z of Women. Facts on File. ISBN 978-0816066940. ^ a b Smith, Noel Lyn (17 October 2011). "Celebrated Diné poet visits with St. Michael students". Navajo Times. Retrieved 14 May 2014. ^ a b c d e Dunaway, David King; Sara Spurgeon (2003). Writing the Southwest. University of New Mexico Press. ISBN 978-0826323378. ^ Velie, Alan R.; Jennifer McClinton-Temple (2007). Encyclopedia of American Indian Literature. Encyclopedia of American Ethnic Literature. Facts on File. ISBN 978-0816056569. ^ Farah, Cynthia (1988). Literature and Landscape: Writers of the Southwest. El Paso, Texas: Texas Western Press. p. 132. ISBN 0874042062. This page was last edited on 25 March 2019, at 00:14 (UTC).